There are many different tail light upgrade options for the F-150. Everything from the blackened SVT Raptor tail light lamps to high-end aftermarket LED options. We decided to go with the blackened OEM tail lights since we are going for the blacked-out or blue and black two-tone look. Our goal is to remove all of the chrome. It's a simple upgrade and the SVT Raptor black tail lights achieve the blacked-out look well. More photos available on our Photos page. 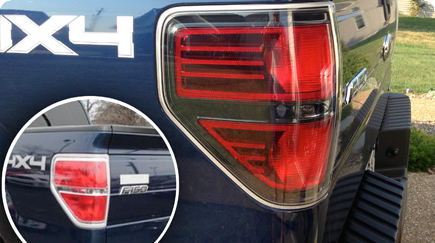 Not only is it easy to replace your F150 tail lights, it almost pays for itself... No, really. Save the packaging from your new lights and sell your stock tail lights on eBay. You will be surprised by how much your used tail lights go for.